This from Cathleen in Clearwater, FL. 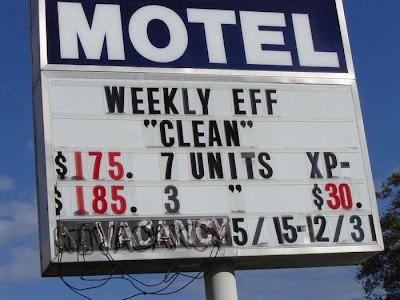 I'm guessing these are appropriate, but why would you say so about your own motel? I have no idea what this sign is advertising. I'm interested in the weekly eff! I could use a goof eff this week. As long as it's "clean". If anyone's not in the know, "EFF" refers to efficiency rooms (meaning, they have their own tiny stove, fridge, etc.). Like a tiny apartment without those pesky background checks and leases. Considering that's it rented by the week, it probably attracts drifters. So perhaps "CLEAN" is a polite hint to potential residents that they need to be drug-free? I know they're ditto marks, but I prefer to think they've just suspended some QMs in air. Ah, thanks Anonymous you've shattered a sweet illusion as to what an EFF in a hotel room might be. Thanks! Only in the hourly ones, hun. "Eff off." Much more fun thinking about those meanings in a hotel room for 175$. "We clean the rooms (at least weekly), but they may still be dirty/toxic due to the large percentage of our clientele that come here to cook meth in our "efficiency room" coffee pots." This sign reminded me of a Chris Rock stand-up routine when he's talking about people who get on t.v. and say things like, "I TAKE CARE of MY kids." or "I FEED MY baby." He says, "What are you talking about? You're SUPPOSED to take care of your kids! It's not something to brag about!" You're SUPPOSED to clean your motel...! I think it's more like, someone said they were clean once. Not us, but someone.